Life usually reflects what you are, in terms of the people you meet and the experiences you have. For instance, happy experiences happen to positive people, success happens to successful people, and exciting experiences happen to interesting people. If you want to meet fun-loving and exciting people, you should be fun-loving and exciting first. If you want your social life to be happening, you should be social and outgoing in the first place. Know that it is a gradual process. The first step towards being more social is acknowledging that it is a gradual process. Do not expect things to happen overnight. Also, do not try to achieve everything all at once. Make your social life a top priority. If you are not happy with your social life, make it your top priority first. Invest time in meeting people, spending time with them, socializing, etc. Start small. You should start by taking small steps. For instance, start getting out of your house more often. Practice listening intently and ask more questions in a conversation. Initially, talk to one or two friends and then gradually inspire yourself to talk to at least one new person every day. 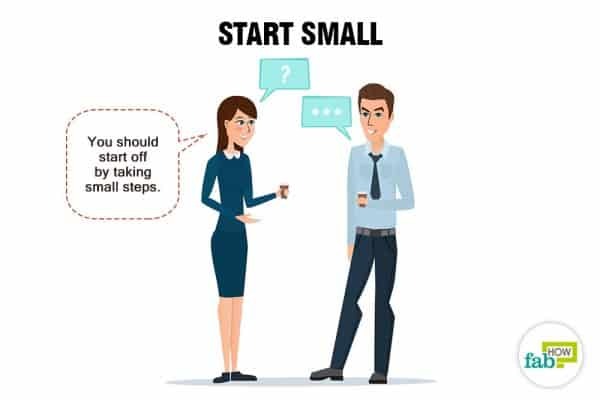 These little things will give you confidence and make you handle difficult social situations more easily. 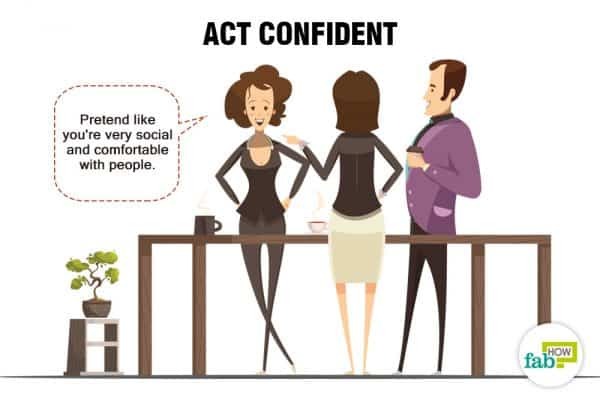 Build a confident body language. If you want to feel confident and outgoing, you should possess a confident body language when meeting new people.Look approachable and nod at them. It is also helpful to avoid isolating yourself, frowning, and crossing your arms. Body language says a lot about your confidence. Make eye contact. 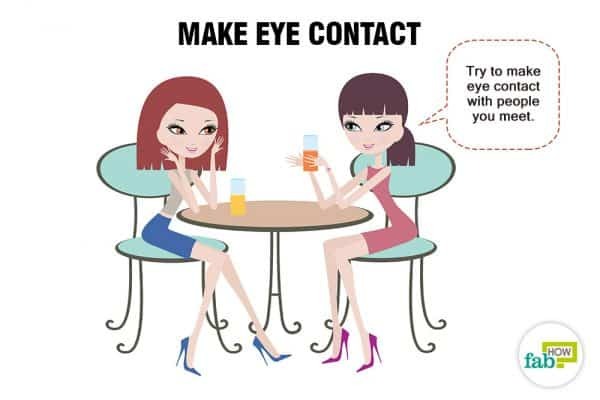 Try to make eye contact with people you meet. Look into their eyes instead of looking at the floor or your feet. Avoid staring. Smile more often. Smile as much as you can to improve social skills. Smiling is the most natural and effortless expression. For instance, try smiling genuinely at people you pass in the street or smile at someone at the petrol pump while you are filling gas. By smiling, you are telling people that you are an outgoing and pleasant person worth knowing. Greet people. As soon as you become comfortable making eye contact, say hello with a smile. Smiling is important. Act confident. Even if you are uncomfortable in social situations and feel anxious and nervous, most of the time people fail to notice what you feel inside. Therefore, pretend like you're very social and comfortable with people. This helps you feel that you're someone else. And before you know it; your alternate character will become a part of who you really are. Make it a habit to be friendly. 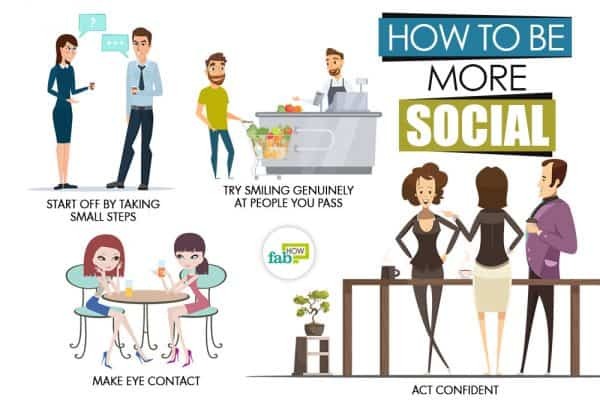 If you want to be more social, try to be friendly and outgoing when meeting others. Introduce yourself with a smile, be willing to initiate a conversation, make the first move. Friendliness helps improve social skills. Master the mannerisms of someone you want to emulate. Observe others with good social skills and try to see if you can emulate them. Observe their body language, the way they interact with people, how they respond to things you say and do, how they are with new people, etc. Pick up the best social skills from a diverse group of people and try to put it into practice. Get out of your comfort zone. Force yourself into situations that will compel you to get outside of your comfort zone. For instance, if you have a desk job where you do not have to interact with people, look for other employment that involves you meeting new people constantly. This will make talking to people in your day-to-day life much easier. Deliberately put yourself in situations that you know will make you uncomfortable. Facing such situations and going through them on a regular basis will help you overcome the fear of social situations. Have a positive attitude. Your optimism will attract others. People usually love being around positive and optimistic people. Be grateful. Always be grateful for what you have. When you start thinking about the good things in your life, it raises your self-worth. It builds your confidence and makes you willing to go ahead and talk to people. Work on your self-image. Change your thinking about yourself and eliminate any self-limiting beliefs that you have about yourself. Create a social ritual. Set a social ritual that makes it easier for you to connect with people without thinking about it too much. For instance: Take out an hour every week to follow up with people you know. Call, email, or text people with whom you have an active friendship. Set a monthly ritual that allows you to meet new people. Your monthly rituals can be attending club meetings and interesting group events where you get to meet new people. 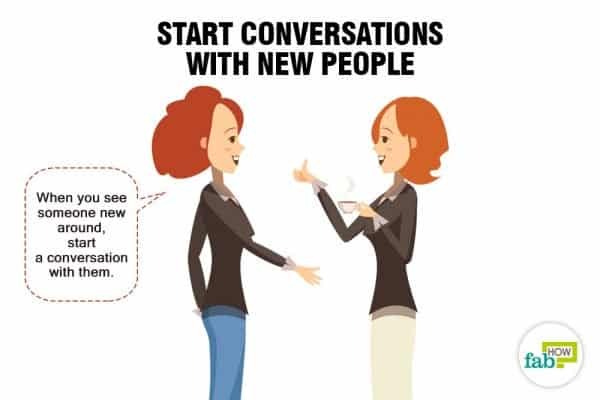 Start conversations with new people. When you see someone new around, start a conversation with them. Even if you do not talk to them at length, simply saying hi and asking for their name will do. Before leaving, tell them, "It was nice meeting you. I will see you later hopefully." Chat back to people who try to talk to you. If someone is trying to talk to you, make an effort to be friendly and talk to them. Instead of giving one-word responses, try to be interested in talking to them. Try and make pleasant conversations with them. Be interested in them. Have a deep desire to connect with people. Be interested in the person you are talking to. Be present. Usually, people are busy thinking about what to say next or focusing on something else than paying attention to what is being said. When in a conversation, try to focus on the present moment. Suppress all your other thoughts until after the conversation. Ask questions. When you ask questions, you show them that you are interested in them. Ask them how they are feeling; how their day is going or what plans do they have for their future. This allows people to know that you care about them. Listen intently. When you listen to people, they will trust you and will have confidence in you. And when they believe you, they can be more comfortable with you. This will in turn, make you feel more confident. Be in touch with people you already know. Keep in touch with your friends. Take out time to chat with your colleagues when they are not busy. Maintain your relationships with people. Don’t avoid people or pretend you did not notice them. When you see someone you know, chat with them even if for a few minutes. Invite people to do things with you. Instead of waiting for people to invite you, be the one to invite people out. 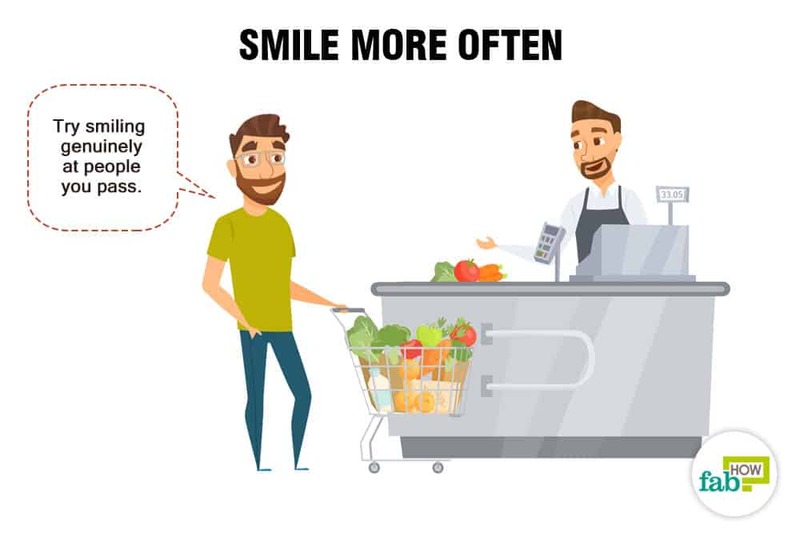 For instance: If you like your new neighbors, invite them to your place for a cup of coffee or ask them if they want to accompany you on a shopping trip. If you come across a friend down the street, ask him if he wants to go for lunch. If he is busy, suggest that you can get together some other time. Even if you are hanging out with a group of friends, ask your colleague or another friend to come along as well. Try to make new people feel included. 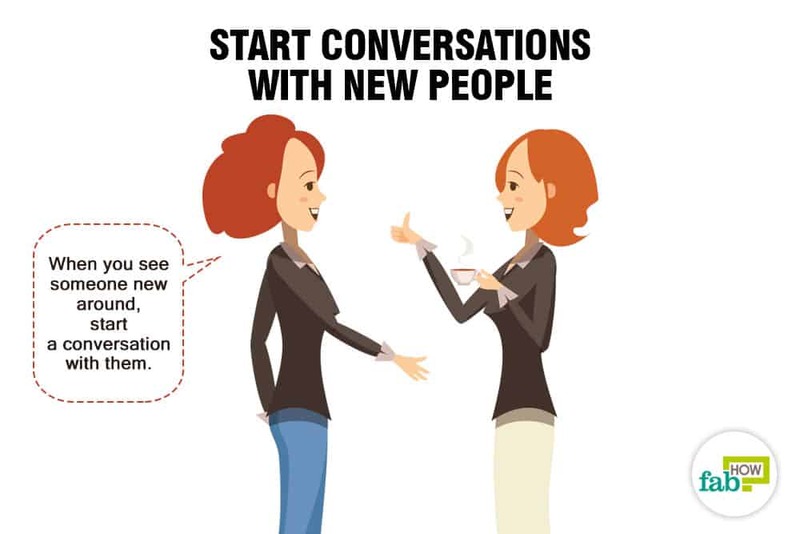 If you are out in a group, and there is a new person in the group, make an effort to start a conversation with him. Do not expect him to come and talk to you. If there is a new colleague, try to get to know him, invite him for lunch and let him get acquainted with others. If you and your colleagues are planning to catch a movie during the weekend, ask the person if he or she wants to join in. Be with people. Join in with people wherever you are. For instance, if you are at a party and everyone is hanging around at the bar, join them. If your co-workers are catching up at the water cooler, join the conversation. This will show people that you are interested in talking to them. When you are there, engage with them, instead of focusing on something else. Make an effort to spend more time with people. Spend time with more people more often, and for longer periods. Spend more time with your friends. If you do not get to catch up with your co-workers during a workday, try and spend time with them during weekends. Do nice little things for others. Cook food for a friend who is unwell; take a cup of coffee for your co-workers once in a while. Offer genuine compliments. Be positive and encouraging to people around you. If someone is wearing something nice, tell them so or if someone is funny, compliment them on their trait. Your compliments should be genuine. Make sure everyone is having fun when you are out with them. See to it that whoever you are out with, is having a good time in your company. If someone is feeling left out in a conversation, try to steer the conversation to the topic they are interested in. Make the person feel comfortable. If your group is playing a game and someone doesn’t feel comfortable taking part in it or is hesitant, try to persuade them to join in. Focus on groups of friends. 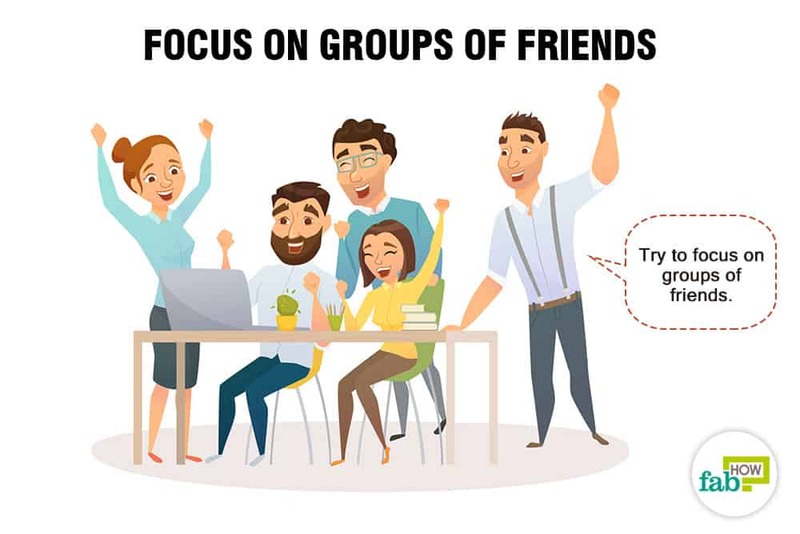 Instead of concentrating on individual friends, try to focus on groups of friends. Introduce your friends to each other. This will help expand your social circle. The people you know will start making plans with everyone in the group, and this will save you the effort from calling everyone and trying to keep up with them. Expand your social circle with people who share your passion. If you love gardening, enroll in a gardening workshop or join a community gardening group in your area. Socializing with people who share a hobby with you is much easier than with random strangers. You are not under any pressure to talk; you don’t worry wondering about what to talk. Conversations come naturally as you share a common interest with everyone there. Don’t control yourself. Eliminate the mental block inside you that controls you from having fun, speaking your mind and being yourself. People are generally less judgmental than what you perceive. Don’t get overwhelmed by outgoing people. Don’t be under the impression that people who talk a lot have anything always important to say. Never let yourself believe that people who speak too much have more to say than you do. Don't get discouraged. You're going to make mistakes. Don't give up - it will take time, and you will get better.